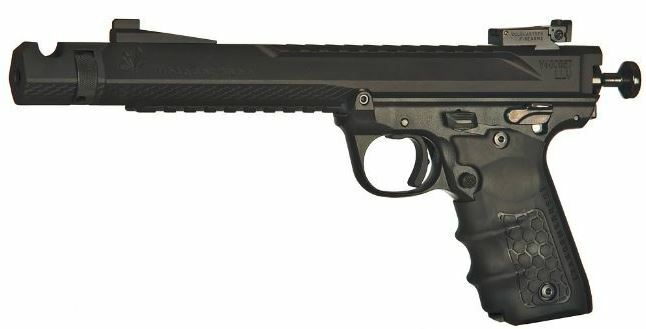 The Black Mamba combines features from Volquartsen's Scorpion 22 LR Target Pistol along with the push button takedown functionality of the Ruger MK IV platform. It all starts with Volquartsen's LLV Competition Upper. Available in a 4.5� or 6� barrel length, it features a stainless steel barrel (with stainless steel breech) housed in an aluminum shroud. This design provides match grade accuracy in a lightweight package. Integral Picatinny rail on top and bottom is standard. Each Black Mamba features a threaded muzzle with Volquartsen single-port comp installed. Volquartsen's Competition Bolt with DLC Coating is ensures smooth operation and functioning whether its a day of plinking at the range or competing at the highest level. The Black Mamba build utilizes a Ruger MK IV 22/45 frame that has been retrofitted with Volquartsen's Accurizing Kit providing a crisp, clean 2.2 lb trigger pull. The frame has also been fitted with Volquartsen's magazine release that, when used in conjunction with Volquartsen's magazine base pads (included standard), eliminates feeding issues. This is accomplished by raising the magazine's position in the frame, allowing the bolt to more positively engage each round as it feeds.